On top of being an Expert shooter, you will need to have great skills with Building if you're looking to win a Battle Royale. If you know the perfect thing to build and the best time to build such a structure, you will greatly increase your odds of claiming that Victory Royale. But this can be extremely difficult to get the hang of, especially when you have ninety-nine other participants tying to kill you. 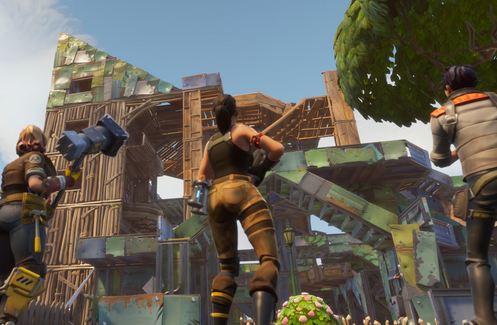 If you're looking to be as great of a builder as you are a shooter in a Battle Royale, then definitely take a look at our Building Tips below! 1) Use the sound of Building to trick others. Whenever a person builds a structure, a certain noise will be made depending on the Materials they are using. You can use this to your advantage simply by building a ramp over their structure and getting the height advantage over them. The entire time you're building they will think the noise is coming from building their structure. 2) Wood is the weakest material to use, but the quickest to build with. Time usually means everything in a Battle Royale, and wood is the fastest material to build with. Sure, it's the weakest of the three Materials, but you can build a structure with it twice as fast. Save to build with your other materials only when you know you have time to do so. 3) Learn where to harvest Materials. If you're looking to build, then you better be prepared to obtain loads of different materials from locations that have them plenty of such. Wood can be harvested from trees and wooden palettes; brick can be harvested from smashing rocks and stone buildings; and metal can be harvested from metal structures like cars and certain buildings. 4) Always build to defend yourself. Should you begin to be shot at, quickly build a wall out of whatever material you have. From there, place a ramp so you can have the option to fight back. But remember, while on a ramp, don't forget to build walls around you to continuously keep your player covered. 5) Learn how to edit structures. It might be a pain to learn how to do this, but it can save you loads of time during a Battle Royale. After Building a structure or while in the process of doing so, you can enter edit mode to divide your walls or ramps into several different tiles. By doing so, you can create given combinations that will allow you to shoot others through holes in the structure or give you a means to escape your structure if it comes under attack. 6) Use Edit Mode to see through the structures you build. While Building, you can actually use edit mode to see straight through your already built wall. This will allow you to see any enemies outside, giving you the advantage of creating a hole in the wall in order to shoot them. 7) Don't built basic forts. Most forts are usually built the same, with four walls and a ramp that leads to the second floor of four more walls. When raided by other players, they usually know exactly how to ascend and descend these forts with ease. Because of this, mix up the inside of your fort with random walls and ramps. This will keep others guessing, possibly confusing them long enough for you to land a headshot.